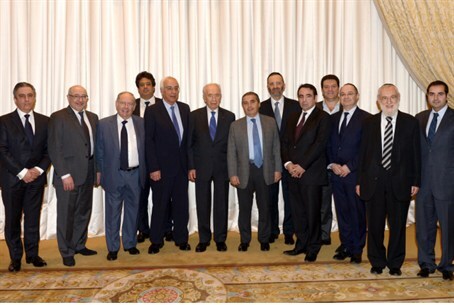 President Peres meets the heads of the Jewish community of France and a delegation of Imams, one year after attacks in Toulouse. President Shimon Peres met on Sunday with the heads of the Jewish community of France and with a delegation of Imams including the heads of the Egyptian, African, Moroccan and Senegalese communities and heads of central mosques. The meeting took place the day before memorial events in France to mark one year since the terrorist attacks in Toulouse. Last year, terrorist Mohamed Merah murdered Rabbi Jonathan Sandler, his sons Aryeh and Gavriel and Miriam Monsonego at the Otzar HaTorah school in Toulouse. Before that, he murdered three Muslim paratroopers of North African heritage. Merah was ultimately killed when he tried to flee a raid on his apartment. During Sunday’s meeting with the Imams, President Peres was pleased by their support for Israel, their moderate approach and tolerance towards other faith communities and their vocal, steadfast opposition to terror in all its forms. According to a statement by Peres’s office, at the start of the meeting Imam Chalghoumi talked about the memorial events one year after the terrorist attacks in France and said, "Tomorrow, March 11th, is a terrible day of mourning for us, a day on which terror struck from which we all suffered. I wanted to tell you, Mr. President, that we Muslims are victims like the Jews, of the same extremist who went on a journey of murder, who took the lives of children. “We are here to say to our brothers the Jews and the French: We are all threatened by terror, hurt by terror and we all call with optimism for peace at the end of this terrible year. We teach the believers that human life is holier than the holy sites! Holier than Mecca, the Vatican or Jerusalem,” he added. Peres thanked the Imam for his words and expressed his appreciation, "Whoever was responsible for the murder of French citizens and Jewish children in Toulouse showed the ugly face of terror, and your words show the way of peace. You are leaders of an Islam which seeks peace, as we do. I am very grateful for your words, and I thank you for coming. I see in you brothers in this path, dialogue between us is important and valuable and that is why this meeting between us is so important. We will work together, for all the peoples of the world, for Israeli's and Palestinians, for peace in the world." Imam Chalghoumi addressed the issue of the approach of the Muslim community leadership towards the State of Israel and said that the delegation is interested in bridging the gap between faiths and peoples. "The Israeli-Palestinian conflict is not an excuse to hate the State of Israel – we are not interested in that hate and do not believe in it. We visited Israel and saw the country, we want to know Israel as it really is and to get to know people from different perspectives," he said, according to the statement. During President Peres's visit with the Jewish community, the leaders of the community in France, including the leadership of the community in Toulouse, updated Peres on the manner in which they have been coping since the murders a year ago. The leaders asked to hear from President Peres about ways in which the peace process with the Palestinian Authority could be re-started, the latest developments with regards to Iran and the general situation in the Middle East in light of the Arab Spring. President Peres and the community leadership also discussed incidents of anti-Semitism in France. France has seen a surge of 45% in the number of anti-Semitic incidents over the past year. Last month, a woman was arrested after trying to stab a student at the same Toulouse Jewish day school which was attacked last year, and which has since changed its name from Otzar HaTorah to Ohr HaTorah. The incident last month took place as a 16-year-old student walked out of the school, when he was suddenly attacked by a knife-wielding woman who tried to stab him while calling out anti-Semitic insults. The boy managed to escape and flee back into the school compound, where he called for help. Police who were called to the scene and collected testimonies from about the incident were able to arrest the attacker at her home shortly afterwards.